Unofficial because this is a non-commercial enthusiast site. This site has no official connection with the BBC or with any companies or magazines mentioned on these pages. Falcon Acoustics B110 SP1003 now available. KEF 50 Years of Innovation in Sound by Ken Kessler and Andrew Watson now available from KEF Direct. Ken tells me that his new book on the history of KEF includes previously unseen material and photographs about the LS3/5A. A must have for LS3/5A fans. www.ls35a.com has been re-indexed. The search box at the bottom of this page and the site map should now work much better. In response to some recent email enquiries from visitors to this site concerned about buying fake used LS3/5As I have added some tips in the Buy used LS3/5As section. If you have any experience or photos of fake LS3/5As please contact me. Stirling Broadcast who make the LS3/5A V2 have told me that they have a new comprehensive spares service for legacy models. Please see the Stirling Broadcast web site for more information. Falcon Acoustics who have a long association with the LS3/5A are under new management and have made available LS3/5A spares. Falcon have recently added The RAM Loudspeakers Story including an interview with Vince Jennings, the founder of RAM, to their web site. The material on these web pages is copyright and may not reproduced elsewhere without the permission of the owner. If you wish to use anything from this web site please ask, I almost always say yes. I would like to thank everyone who has contributed material to this web site. All manufacturers trademarks are acknowledged and any errors will be corrected if I am contacted. If you have a LS3/5A related web site please contact me to include your link. Please use http://www.ls35a.com when linking to us rather than individual pages which may change or be deleted. Would you like to make a donation to www.ls35a.com? Perhaps the site has helped you with information about your speakers or to repair some LS3/5As or to sell a pair for a good price? For ten years www.ls35a.com has been completely free to use, without any advertising and independent of any commercial interests. I would like to keep it that way. Funding for www.ls35a.com comes from myself and from the generosity of donors. 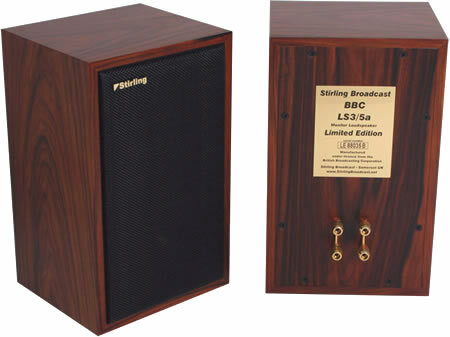 Our policy is to support everyone who is interested in this little BBC monitor loudspeaker including companies who make the LS3/5A or related products. Andrew Drummond has very kindly donated the cost of the domain name registration since the web site started and I have paid the hosting cost. The volume of traffic through the site continues to grow and with about 35,000 visitors a year who make about 150,000 clicks and 10Gb of downloads each month, I can't use a free or home hosting package but have to subscribe to a business package. Donations to www.ls35a.com are entirely voluntary and if you don't wish to make one then you are still most welcome to use the site. If you would like to make a donation then please send it to me at my Paypal email address.